The Magpie's Nest...: There's no rest for the wicked, but nevertheless The Magpie is feeling somewhat relaxed just now (as you will see). There's no rest for the wicked, but nevertheless The Magpie is feeling somewhat relaxed just now (as you will see). But it's Magpie season all year round, so the old bird can't ignore the wonderful consistency of The Daily Astonisher - a consistency that is less than smooth, and certainly is not free of clots. Right to the dying days of the year, the Bulletin manages to make up stories. And can't even agree on facts between themselves. Right up to the last Saturday of the year, the Townsville Bulletin has managed to conjure up a screaming headline out of thin air that is guaranteed to make sure we feel we have a rotten community that is prey to all sorts of uncaring bureaucratic impositions. 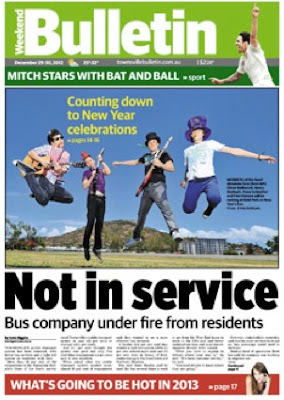 And as usual, it's based on bullsh-t.
A front page screamer tells us brealthlessly 'NOT IN SERVICE' with a secondary headline decaring 'Bus Company Under Fire From Residents'. But the buses ARE in service, and let's have a look at the second claim. Talk about lies, damned lies and statistics. And about being up yourself. The residents in question have been winkled out of replies to the paper's annual box-ticking, pompous and highly unrepresentative ' State of the North'. This annual exercise in manufacturing fairydust stories from the resultant whinge-fest takes ticked answers to a plethora of questions in a published iist of what the paper thinks are 'hot button' issues, for the sole purpose of having something to alarm you with during the silly season. Be ready for dozens of stories quoting these dogdy statistics across a whole range of things you didn't know you should be worrying about. In the article itself, Kath Skene tells us that there were 938 replies to the survey - NOT the 'more than a thousand' in the supporting editorial. (The 'Pie's money is on Skeney). Of these, 48% ticked the 'poor' box and 42.4% rated local bus services 'average'. Lumping those together, we learn that more than 90% of respondents are less than impressed with Townsville's transport arrangements. Question: is that word 'average' - ie in the sense that the bus service was more or less what one would expect, or 'average', as in the usual meaning around here of 'The Townsville Bulletin is pretty bloody average'? Probably the latter. But if we're going to muck around with statistics, let's try this exercise. 938 respondents (and that could include multiple responses from any individual with a bee in their bonnet about something or other) divided into the population of Townsville (we'll ignore 'The North' claim) at around 185,000, we come up with a percentage of one half of one per cent. And of that half a per cent, if we take those who rate the transport system poor, we have .25% - that is 'point two-five' - who ain't happy. 'Slammed'? 'Under Fire From Residents'? Thus are headlines and stories made in The Bulletin - and there'll be plenty more under that formula over the next few weeks. Incidentally, there was a very interesting (and uplifting story) about the strong performance of super in the past year in the busines section. Sure, it was 'brought in from down south' but by a respected economic journaist. It was no doubt of interest to thousands of Bulletin readers and was good news in a season when we'd all like to have our feet up, relaxing. The 'Pie idly wonders why that wasn't considered for the front page of the Saturday flagship - but then, good news is no news down at The Astonisher. There ya go, a one bird whinge fest, and that's enough for 2012. Finally, the old bird has been hangingv a claw down at Bondi with family. 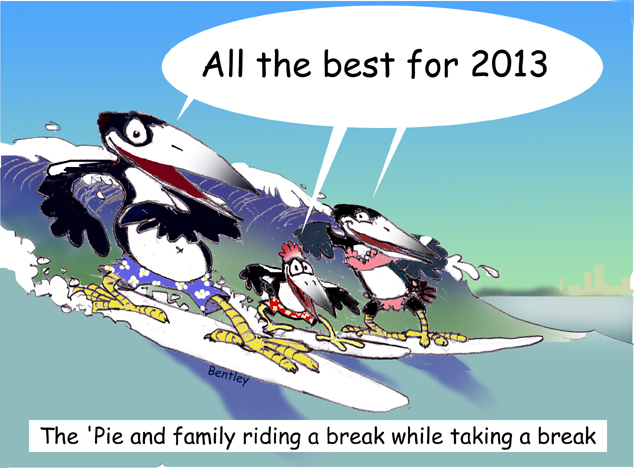 Bentley has a whimsical idea of The 'Pie's surfing prowess, but he envisaged three Magpie generations going for it, dude. Enough. No Poseurs' this week, it is closed for it's annual hosing-out and fumigation. Have a great New Year - the old bird certainly intends to. Yes 'Pie that was about the third headline story milked from the dodgy stats. But what about "ace cubby reporter" Simpleton in his "column" complaining that the local pollies and councillors didn't send him a xmas card in response to his "e-card"? He then stated that his "Exclusively Revealed" stories were not personally or politically motivated (he left out "biased")but issues that needed to be reported. What utter crap! !Who does this youngster (been in TSV a year)think he is kidding?? Statistics and commentators. The sample size is adequate to give a result with a high confidence level. That is statistics analysis truth. But it wasn't a random sample and THAT is the real problem. It was self selecting. You just can't draw down gross numbers to a percentage to justify your hypothesis, it just doesn't work that way. Magpie - have a good break and a Happy New Year. I wrote a comment to Simpleton and gave a few hints on how to gain our respect. Can't understand why it was not published, but up to this time no comments have been published! Hoist on his own petard perhaps. My wish for next year is a Townsville News-site where we can enjoy the thoughts of people other than the Bully editor. The sample size is better than most polls and no survey asks every single person what they think so the Pie's maths about equating it to just a small portion of the city is off the mark and an attempt to spin the facts almost like the Astonisher does. The fact it was not a random sample is the issue here but one could argue the paper's readers are from all walks of life. I thought Skeeney was a Walkley winner? Should enter this article in the next round of awards. Newspapers all over Australia are trotting out their dodgy surveys right now to fill holes during the silly season. As a former journo and editor, I've done the same over the years. When really strapped for a story,we would send out a reporter to seek public comment (vox pops) on a topic of current interest. One of my funniest moments came more than 45 years ago on the streets of Bunbury, WA, when I was asking people to comment on scientific studies that tooth decay could be spread by kissing. I approached one middle-aged, dissolute looking gent and asked him if this would pose a problem in his love life. "No worries, mate", he answered with a meaningful leer. "What I kiss doesn't have teeth!" Happy new year,'Pie. Have fun with the family (please, no budgie smugglers) and keep sticking it up them when you get back home. Cant believe Simpleton wrote in his column about no Christmas cards from State/Federal pollies and local councillors!.When you deliver scoops like council overspending and daring to buy electronic pencil sharpeners and then the so called cover up of the consultants report which was cleared by the CMC.The Bulletin has to stop dumbing down editorial to the people of Townsville and have a paradigm shift in culture.Looking forward to the pie in 2013. Anthony Simpleton didn't sent The Magpie a Christmas card - nor did (sob) Mayor Mullet, Dumbo Jumbo Ewen Jones, (blub) His Radiance, Messagebank Walker, (sniffle) David Kipper Kippen or David 'The Party Animal Moyle - or those the old bird has been writing about professionally like Typo Gleeson, Lachlan 'Harry Potter' Heywood, Michael The Ogre of Ogden Street Wilkins, Ann Attila The Hen Roebuck, and Kate 'I Can't Think' Higgins ... perhaps the old bird should write a column about that! Bet Simpleton gets as many sympathy cards as Chrissy cards. What a dork. If Mr Templeton was making a joke in his column about the lack of season's greetings cards from his subjects during the year, he should realise that his complete lack of self-awareness (judging from previous weak efforts at commentary) disqualifies him from any such attempts at humour. But I don't think he was being funny - just being true to form. Grow up, mate. Ron, please come back. You're very entertaining too. Skeney certainly deserved her Walkey. By design or accident, the iditor (even a stopped clock is right twice a day) left her alone to do the straight-arrow reporting, and she and her photographer, as previously mentioned, ran the aggressive gamut of the rorters, thieves and spongers who were leeching on their own people and scuttling behind the race card for cover when challenged. It didn't work in part because Kathleen Skene stuck to her guns. Definitely the stuff of Walkleys (and the last the Bulletin is ever likely to see under current policies). And The 'Pie will bet the opening couple of pars of her transport survey story, using terms like 'slammed' and 'under fire' were somebody else's idea, it's not the sort of terminology The 'Pie recalls Kath using in general - but if that's not true, perhaps she's just getting in the groove to start working for Typo Gleeson on the Coast. As for everybody getting an award in the media, you're probably right up to a point - some 60 folks from The Astonisher have recetly received the Royal Order of the Bum's Rush, and in this festive season, can contemplate from afar their former Townsville-based jobs being celebrated in Brisbane or further south. Always good and always entertaining. I'm not sure about Skeeny. She has her moments. She was lucky to win that award. Everyone in media eventually wins something. Skeen's relationship with Atil to rid a pup 'disabled' reporter was interesting. She might be like 'Mick Carrol' but they don't stand up within the organisation just others. Let's face it, Jason's still working at news and so too is Ogre of Ogden St.
Skeen and Typo was a combo. I worked for the Astonisher. I will never work for a newspaper again. It was a traumatic experience. The public interesting, the staff HR's horrible. Higgins revealed the stats from The Bulletin's State of the North survey. It showed that drivers deem others average. I wanted to 'win' the Ipad prize for taking the survey. The survey must be true. Here are some other questions asked. Has 2012 been a financial struggle? In the past 12 months did your household income? Which of the following has most impacted your household budget? Do you think the relationships between Mayor Jenny Hill and some other councillors and staff have affected the performance of the council? How do you rate the driving of Townsville motorists? Interesting that Murdoch's stock has risen to 25 a share. Due to staff cut backs?